[Resolved]: The network cable had been connected to the integrated NIC physical interface, which although accessible, was no longer enabled. The problem was solved by connecting the cable to the additional I350 Gigabit adapter. Stupid as it sounds, as usual, a human mistake. Server running smooth and pleasantly. Many thanks in advance for whoever comes up with an idea for this puzzle! The story short: I am setting up a new Dell EMC PowerEdge. Ubuntu 16.04.3 LTS installation has ran smoothly using iDRAC v8 with self-configured network profile. Now, I try to bring up the additional Gigabit Ethernet interfaces (2xIntel I350) and I can't even see the device locally. ifconfig shows me a fully configured interface (enp177s0f0) and ifup confirms this with RTNETLINK enp177s0f0 already configured. However RTNETLINK ip link show dev enp177s0f0 shows me the same interface in state "down". 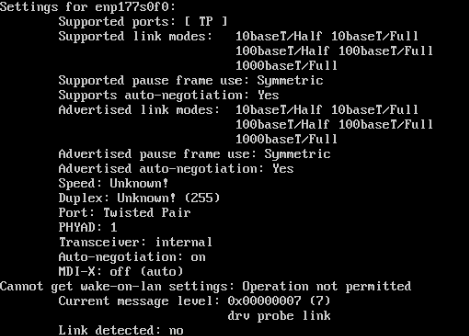 Trying to bring the link up (ip link set dev enp177s0f0 up) is doing literally nothing. I have restarted, stopped and started the networking interfaces (/etc/init.d/networking restart) in all possible combinations. Reboots included. The /etc/network/interfaces contains a valid network configuration working on other servers. Any ideas what could be happening? Anyone knows if Ubuntu may be lacking drivers for the I350 and if so, how to bring them on the server through iDRAC? Could it be a speed negotiation issue with the switch? I am using an AT FS705EFC/SC with cat6a network cable. I use a different IP address on the iDRAC and the Gigabit interfaces. To my knowledge, this isn't an issue, but I am happy to learn if I am missing something here. Browse other questions tagged ubuntu networking dell-poweredge gigabit-ethernet or ask your own question.